Can you really think of anything better than apple crisp? Warm, cuddled in front of the tv, spooning in soft apples with crumbly topping...mmmmmm. I want some right now. In my desire, I had to come up with something I could make to fill the need. Welcome to the healthy side of apple crisp. Remember my Homemade Granola? Stroke of genius, well, I think so. 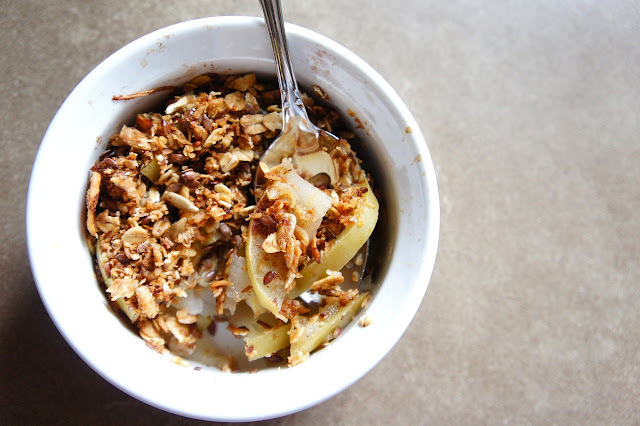 Apples get soft and delicious with heat, add some cinnamon to kick it up, and top with granola! Is it sugary and buttery like the original? No, and that's why it's better. It still tastes warm and sweet, but the right sweet. Preheat oven to 375. In a bowl, mix your sliced apples and add some good shakes of cinnamon and stir to coat apples. In a 8x8 pan, spread your apples evenly on the bottom. Top apples with your granola. Cover with foil and bake in oven for 10 minutes. Check apples to see how soft they are. I didn't let mine get soggy, I still wanted them to keep some shape. If they are close, then take off your tinfoil and let back for another 3-5 minutes. If it's not close, cook for another 3 minutes and check again. When you do take the foil off, keep an eye on your crisp so you don't burn your granola. Remove from oven and spoon in.